Life with Lesley: E.T. THE EXTRA-TERRESTRIAL on Blu-Ray! E.T. THE EXTRA-TERRESTRIAL arrives on Blu-ray for the first time on October 9, 2012. Can you believe that it has been 30 years since E.T. THE EXTRA-TERRESTRIAL first aired in theaters in 1982?! I feel so old! It seems like just yesterday it was coming out and was the blockbuster movie we all wanted to see. E.T. 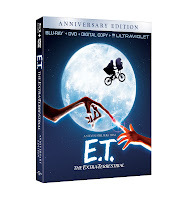 The Extra-Terrestrial Anniversary Edition (Combo Pack: Blu-ray + DVD + Digital Copy + UltraViolet) is available on Amazon for pre-order for only $17.96 and it's eligible for FREE Super Saver Shipping.